Would you rather have Lunar:The Movie or Lunar3:The Game? Well, by everything I know about Lunar; I think Lunar3 is going to come out in a year or so... You obviously ask why I say this?, and I shall tell you. It is because of the all Lunar games that have been coming out recently (i.e. Lunar Legend, and Lunar:Dragon Song). This is why I think Lunar3 is due to be released soon. IGN says it's due to be realeased in Dec, 05. (Yes, I know that is old information.) Also, if you look on the Working Designs website under schedule, it says that an unnamed Strategy/RPG game is coming out in 2005. Hopefully that is Lunar3. As always, words fail me. Except that they don't. 1) Since WD has had nothing to do with "all" two most recent Lunar games, there is no reason to think they'll have anything to do with Lunar 3. 2) IGN has had that date up for years, and is about as reliable as whatever it was that said Lunar 3 would be on the PS. 3) The interview in the current Nintendo Power states that any future games will be dependent on the fans, i.e., will likely only be made if Genesis/Dragon Song does well. It's not a given. 4) I haven't heard of a minigame on the EBC Making Of. That I recall, anyway. 5) Growlanser 4 has nothing to do with Growlanser 1-3. I still haven't played 3, but considering it's a prequel to 1 and 2 I would guess that that's what the To Be Continued is referring to. 6) Four Hero Story was this very site's April Fool's joke in 2003. I think the screens and material are on LunarNET still somewhere. 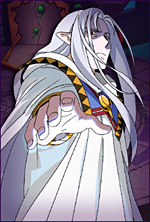 However, that same NP interview did say that if there's another Lunar game the next one will be about the Four Heroes, so you're not entirely off about the possibility of it coming before Lunar 3. Growlanser 4 has nothing to do with Growlanser 1-3. I still haven't played 3, but considering it's a prequel to 1 and 2 I would guess that that's what the To Be Continued is referring to. Yeah, Grow 3 takes place 1000 years before Grow 1, which is a year or so before Grow 2. I wonder why so many game civilizations only seem to have game-worthy eras 1000 years apart. Hm, I can't seem to find the FHS stuff, and yet I do remember coming across it on the site in some obscure section. Well, it'll probably resurface sometime. Yeah, it still fools people at times to this day. I'm really glad we did that April Fools joke. It's going down as one of the better ones thanks to all of Renn's work. I'm curious what's happened to him though. Haven't seen him around for a good year or two now. Oh man, this is too much... Alun already said everything that needs to be said, anyway. Grr!...That gave me false hope too...But you guys did a really good job...and now I feel like an idiot. You forgot some key staff. Julie and Alayna were my personal assistants. GhaleonOne wrote: You forgot some key staff. Julie and Alayna were my personal assistants. Heh. Well...You came up with the idea! You're evil. I was an innocent bystander drunk with knowledge and power! Knowledge and power I tell you! But Game Arts has to do with almost all the Lunar games. And your point is...? WD and Game Arts aren't the same people. Game Arts develops, or oversees someone else developing, WD localizes. Except that they didn't localize Legend and won't localize DS, so they're likely out of the Lunar business. You cited the presence of an unnamed RPG on WD's site as a possible Lunar 3, but since they aren't on the development end and they don't seem to be doing Lunar any more it really doesn't support the likelihood of Lunar 3. They still wouldn't make it though. GameArts would "make" it. WD would localize/translate it. Or rather, likely JAM or someone else would make it, with GameArts supervision, much like every other Lunar game since the the remakes. True. Maybe you guys could make FHS into an actual game. Couldn't hurt.